Daily, structured meetings are an engaging way to start and end each day, build a strong sense of community, and set students up for success socially and academically. An emphasis is placed on shared discussion, connecting with one another, and self-reflection. Each day begins with a Morning Announcement slide, which you can customize to whatever you may need for your students that day. There is a template, but you can add and delete as needed. The next slide rotates through Math Puzzlers, Word Work, Joke of the Day, Writing Prompts, and other short activities designed to provoke both academic and social/emotional conversations. You and your students will get to know each other better and create a genuine classroom community. The final slide for the day is the End-of-Day Reflection. For this discussion, students are encouraged to reflect back on their day and share their thoughts on the questions provided. 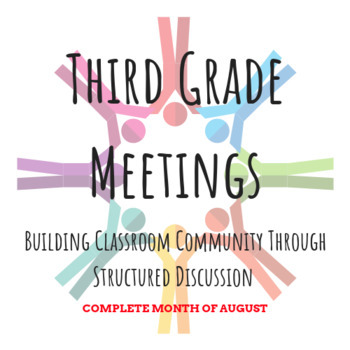 These discussions promote goal-setting, thinking about things in a new way, or even sharing a laugh while building community. This slideshow has everything you need for 22 instructional days in the month of August.